When Grace Hui moved to Los Angeles from China in 2014 and Googled the Chinese characters for “Los Angeles immigrant,” the first result was Chineseinla.com. The Chino Hills-based website, a disorganized Yelp-meets-Craigslist hybrid, was a throwback, and Hui, 29, thought some of the posts were phishing scams. But with more than 680,000 listings, more than 350,000 registered users, 2 million monthly visits and sister sites in 15 cities, Chineseinla.com has become a teeming virtual portal to Chinese life in America. It’s one of the only ways that Hui could connect to a country she couldn’t understand. In the San Gabriel Valley and in Chinese enclaves across the nation, a new wave of Chinese immigrants — many of them affluent students with poor English skills and a smartphone habit — are tapping into a parallel system of Chinese-language apps and websites geared toward helping them navigate life in America. For restaurant recommendations, there’s Chihuo, a Chinese food-centric Yelp or Zagat. 2RedBeans, the Chinese OkCupid, helps Chinese speakers find love. They travel with ETAcar, a Chinese version of Uber, and order food with ToGo626.com, a delivery app that works with about 400 restaurants, most of which are in the Chinese neighborhoods of the San Gabriel Valley. The growth of these websites are a side effect of a stubborn reality: the language and cultural barriers that new immigrants face extend onto the Internet. As unprecedented numbers of Chinese people arrive in Los Angeles searching for prosperity and an escape from China’s problems, they find themselves in an alternate version of the city — a Los Angeles where the best restaurants are in San Gabriel, the most capable doctors are in Monterey Park, and Arcadia is the hottest real estate destination in California. Chineseinla.com, launched in 2006, is one of the oldest parts of the Chinese-language Internet, according to founder Zach Song. It began as a Wikipedia-style collection of knowledge that Song hoped would help new immigrants combat the feeling of helplessness he and his wife felt when they first came from Shanghai in 2003. “We wanted to this to be a community,” Song said in Mandarin. The website’s users eventually grew more interested in selling things, so he redesigned the website to function like Craigslist and include business listings and reviews like Yelp. As online advertising became their main source of revenue, he incorporated Chinese-language news posts and discussion forums to draw traffic. 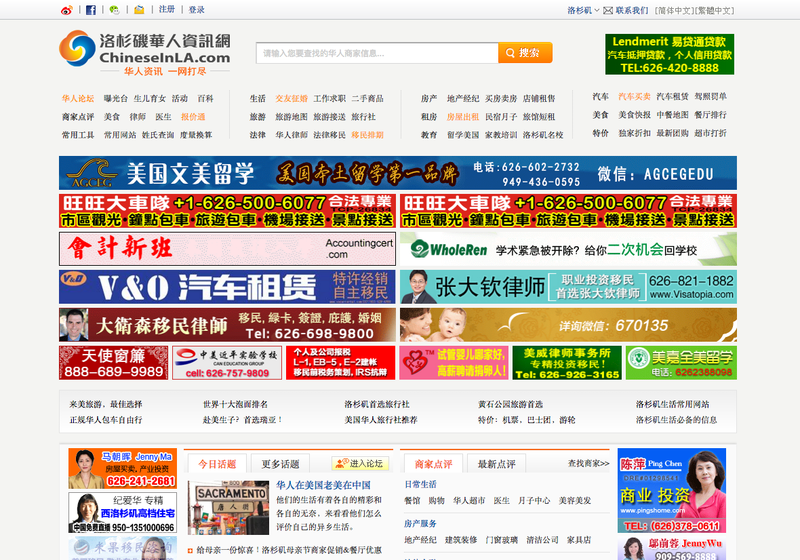 Nowadays, the website looks like an exploded phone book. Information must be extracted Jenga-style from a colorful blinking tower of dozens of different ads for things such as luxury car rentals, travel agencies, tutoring services and birth hotels. Song acknowledged that the design is chaotic. But the site is profitable, he said. Traffic has grown steadily as the county’s Chinese population and tourism levels rise. More than half of Los Angeles County’s Chinese population speaks limited English, according to the American Community Survey, and a larger, temporary population of Chinese students, tourists, and travelers has even fewer English skills. For companies such as ETAcar, the language barrier means profits. The Chinese-language ride-hailing app, largely similar to services like Uber and Lyft, launched in 2014 and now has about 400 drivers throughout North America, with about 300 in Los Angeles, mainly serving the San Gabriel Valley. Co-founder Xiaotian Liu said he and his investors launched the company after bad experiences with American ride-hailing services on a recent trip. Uber and Lyft drivers failed to locate Chinese restaurants squirreled away in massive strip malls whose signage was primarily in Chinese, and oftentimes they couldn’t communicate with the driver. The language barrier that Chinese immigrants face also prevents American businesses from reaching them. For example, ToGo626.com offers delivery from about 400 mostly Chinese restaurants — fewer than 10 of which are listed on American food delivery apps such as Postmates and Eat24, said co-founder Mac Xu. The app has been downloaded 20,000 times since it was created last year and the company processes about 200 orders every day with a staff of about 40 drivers, he says. For those with no English skills at all, one Chinese-language app, Shenma, promises to handle virtually all details of life in Los Angeles. Shenma Life, Chinese for “magic horse,” is a personal assistant located inside Wechat, a messaging-based Chinese social media app. Subscribe to their account on Wechat or text them requests, and a staff of about eight people in Chino Hills and 10 others in China will handle traffic tickets, hotel bookings, car rentals, class enrollment and anything else a Chinese-speaking student could need. For 24-hour VIP service, users can pay $299 a month or $999 a year. Lu Zhang, director of North American operations for the company, said it has about 3,000 users. 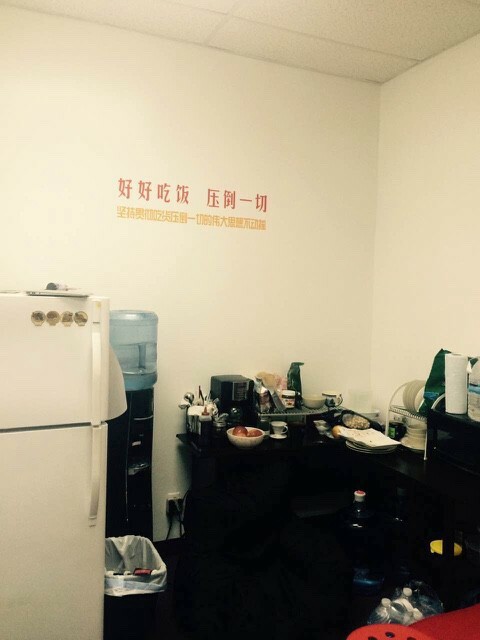 “We can’t do your homework for you, but we can hire you a tutor and give you some studying tips,” Zhang said. One of the biggest shortcomings of the English-language Internet, many say, is how sites evaluate Chinese food. 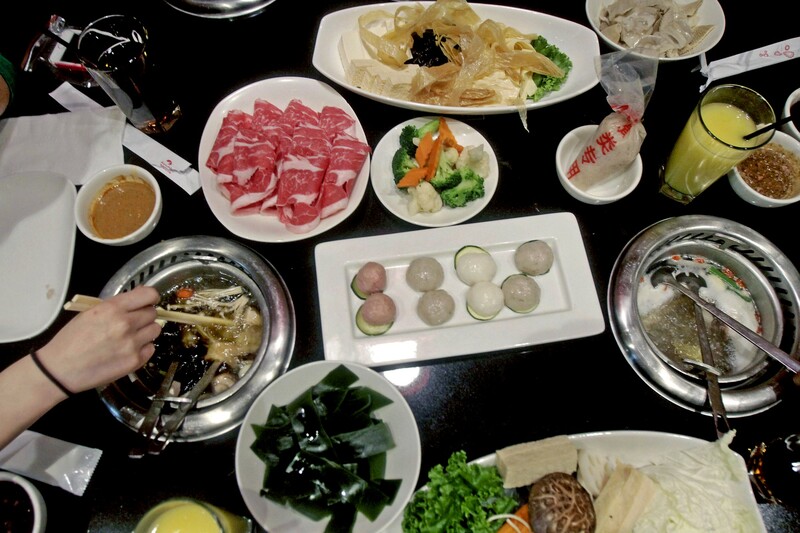 Dai Ho, a noodle restaurant in Temple City, has 3.5 stars on review site Yelp, typical for a cash-only Chinese restaurant in the San Gabriel Valley that lacks service, variety or amenities. But the noodles, hand-pulled and made fresh in limited quantities each day, are revelatory, said Amy Duan, the founder of Chihuo, a Chinese food community. Her app lists it as one of the best Chinese restaurants in Los Angeles. “We always saw five-star rated restaurants that aren’t very good, and three-star restaurants where the food is fantastic,” Duan said. 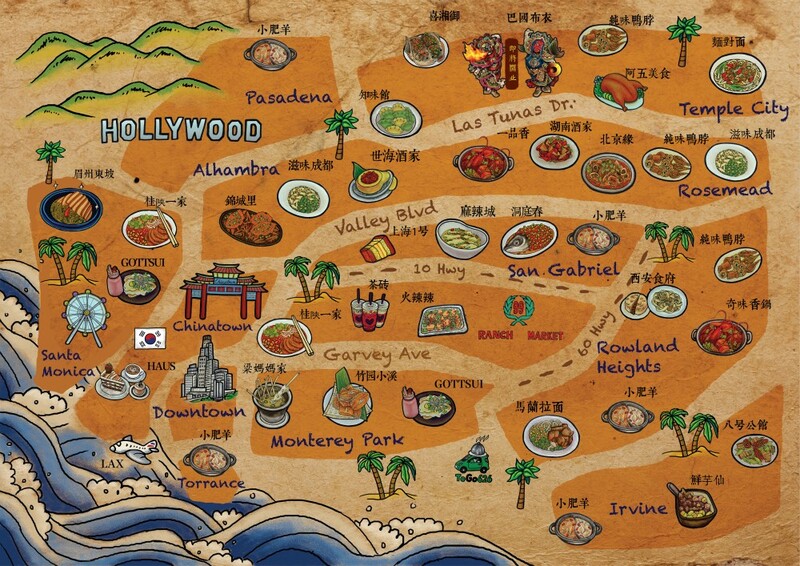 At Chihuo.com’s offices in El Monte, an illustrated map displays a distorted projection of Los Angeles based on Chinese food preferences. The San Gabriel Valley takes up two-thirds of the map, Torrance is featured more prominently than Long Beach, and South and East Los Angeles aren’t depicted at all. Duan and a group of Chinese students at USC launched Chihuo four years ago after their dining club’s social media posts became popular. Today their account has more 400,000 combined followers on Wechat and Weibo, a Chinese Twitter service (on Instagram, Facebook and Twitter combined, they have fewer than 5,000.) Their Web traffic doubled last year. Their audience, Duan said, is Chinese people who are intensely specific about Chinese food. They want to know if a spicy dish has ma la (numbing heat), xin la (pungent heat) or suan la (sour heat), and whether the noodles are hand-pulled or knife-shaved. 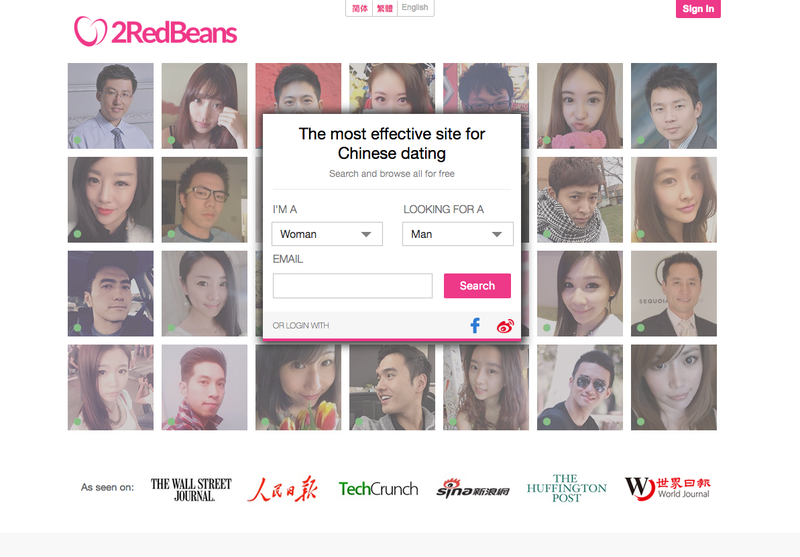 Specific Chinese tastes also spurred the creation of dating website 2RedBeans, said founder Qing Hua Zhao. The site, named for the red bean that symbolizes love in Chinese culture, has more than 690,000 users across the U.S. and in China, and about 70,000 of them are in Los Angeles. Zhao founded the site in 2011 after years of bad experiences with eHarmony, OkCupid and Match.com. It’s not just a language barrier fueling the Chinese-centric sites’ popularity, Zhao said. Newer singles sites such as Tinder and Bumble, swipe-style dating apps, are often too forward and casual for Chinese users, she says. Chinese singles tend to be shy, Zhao said. 2RedBeans caters to that with several nonverbal ways to interact. Users can wink at, favorite or secretly admire other users. If both people admire each other secretly, the app matches you. 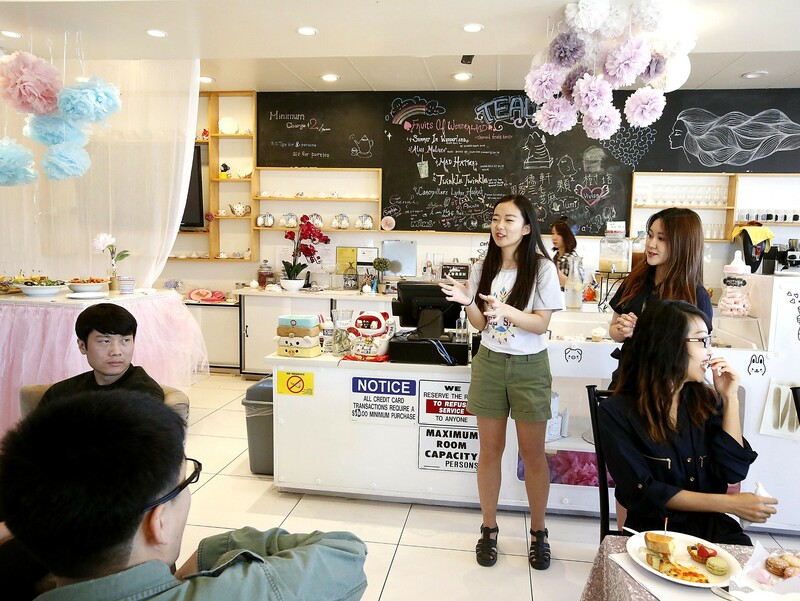 2RedBeans also regularly hosts dating events where staffers help Chinese singles socialize. Last Saturday, about 30 Chinese men and women gathered at Lin’s Wonderland Tearoom in the City of Industry for three hours of guided interaction and finger food. They answered open-ended questions (“Would you prefer to live in the mountains or by the ocean?) and formed teams to answer trivia questions. Successful connections snapped photos of each other’s Wechat QR codes to add them on the social media app. Tim Zhou, 33, an electrical engineer in Fontana, said he has struggled to find a Chinese girl to date. Part of the problem is money, Zhou said. “You can’t drive a Japanese car to pick up a Chinese girl for a date,” said Zhou, the rueful owner of a Honda accord. Still, he’s looking for someone to marry, who can please his parents, help out with house payments and build equity. To him, that typically means a Chinese girl. “You can pick up someone from a bar, but you can’t see their education or income or immigration status. These are critical things for us,” Zhou said. But Zooey Zu, a third-year psychobiology major at UCLA, said that she and her friends came to the United States to experience and understand American life. Chinese apps and websites — and the Chinese neighborhoods that they lead students to — help Chinese students feel a sense of belonging in a strange country, Zu said. But she and her friends are always working on their English. The Chinese-language Internet is starting to reflect that. Chihuo now lists a few American restaurants such as Cut in Beverly Hills, Joan’s on Third, and Taylor’s Steakhouse in Koreatown, and a recent Chihuo pamphlet included recommendations from Times food critic Jonathan Gold. Togo626 is attracting more non-Chinese customers. And some of the apps serving Chinese immigrants have started to incorporate a new feature. With a single tap, all of the text in the apps can be translated back into English. This article originally appeared on latimes.com.